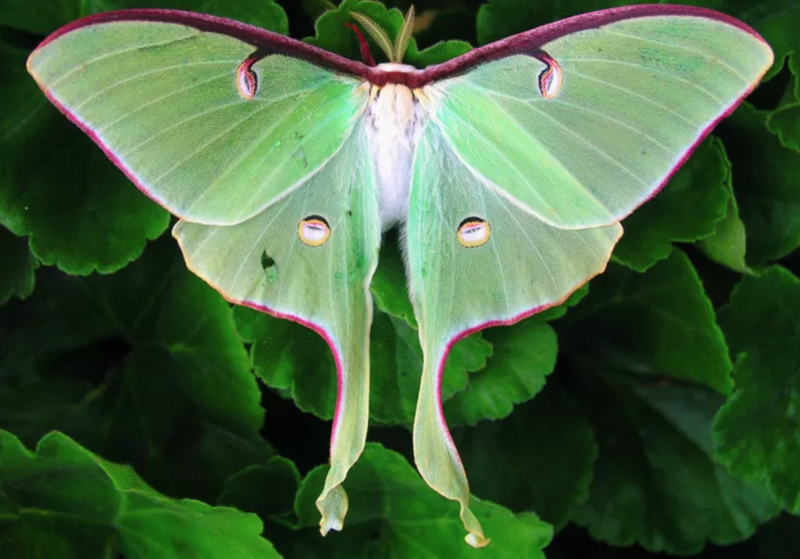 Luna moths have always been one of my favorite winged insects, so I was thrilled when Jen Cameron picked them as the Art Elements Theme of the Month for March. I remember my dad finding and showing me one as a small child, and I've been enchanted by them ever since! 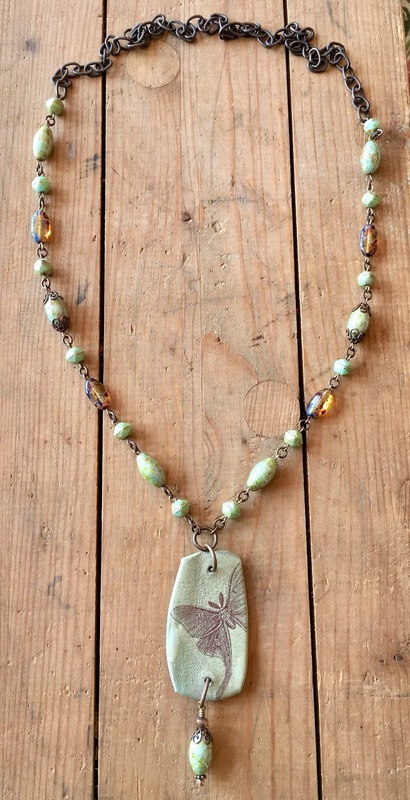 Before jumping into share what I made this month, I just have to share a necklace that I made back in 2014 for myself with my coveted luna moth set by Kerri Fuhr. I probably should pull this one out and take better photos... but you get the idea! I should also go through my jewelry box and get things more organized so that I can find and wear my favorites more often, but that's an endeavor for another day. I've participated in several moth themed challenges over the last couple of years, so I was actually worried that I wouldn't have any luna moth appropriate beads left. Happily, I was wrong! See? First up, I finally got around to using a lovely luna moth ceramic pendant by Tracey Seder Donoughe that Eric bought for me at Bead and Button two years ago. I happened to have a little container of Czech glass beads that I got from a friend who is going through her late aunt's bead stash sitting sitting next to my little corral of art beads. I did a double take and realized that those beads looked gorgeous with the pendant... such luck!! I added in a couple of other styles of glass beads from my stash as well as some brass findings to round out this long necklace design. 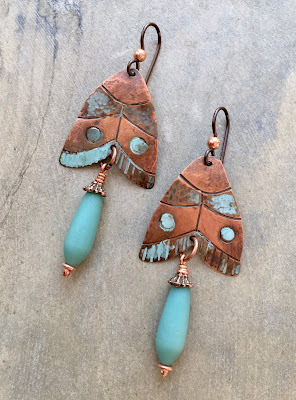 I already had a bunch of beads for a necklace design with Andrew Thornton's sweet little pendant but I got distracted when I rediscovered all the little moths that Eric and I made in Heather Powers' metal sketches class at Allegory Gallery a few years ago. We hammered steel wire on top of the copper to get the patterns and then added Swelligant patinas for the fun (but unpredictable!) color. I found two that were really close in size and coloring and knew I had to whip up some earrings! I made some fun cultured sea glass teardrops dangles, added ear wires, and voila! I might have to keep these for me... we shall see. So, after a brief earring diversion, I returned to the pile of beads surrounding Andrew's pendant. I have to admit that I really had a tough time getting started on this one for some reason but I pushed through for a sweet strung necklace design. 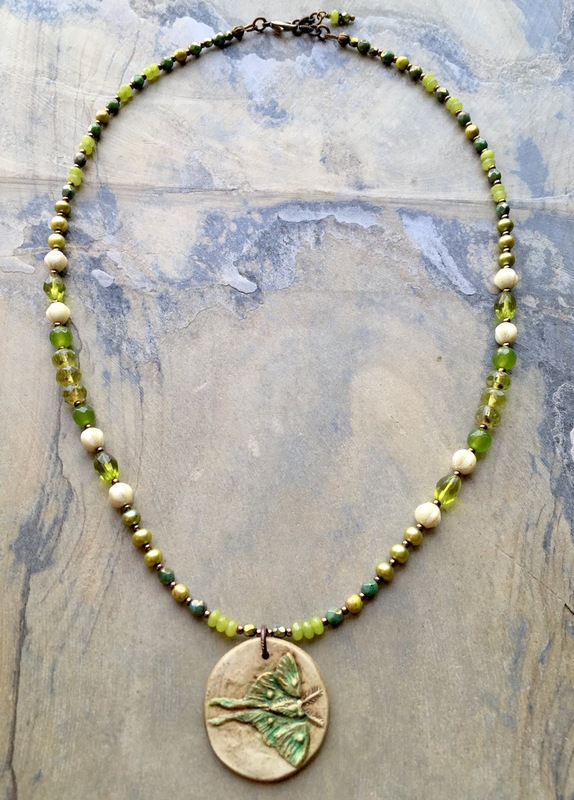 I used a mix of Czech glass, freshwater pearls, and agate in various shades of green plus a little bit of cream. As luck would have it, I got a package from my friend Erin Prais-Hintz of Tesori Trovati with a treasure trove of beady goodness for my Simple Truths subscription including a fabulous moth pendant! 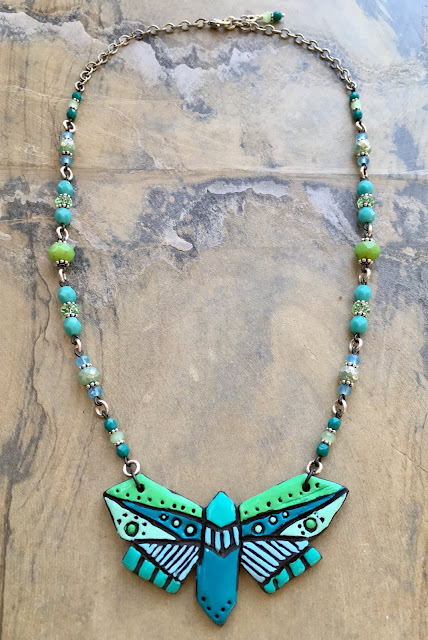 While the moth was actually created for the Art Bead Scene Art Journey One, the one that I received was perfect for this challenge! I couldn't bear to set it aside... I just had to make something with it immediately. I love the saturated colors in this fun, stylized moth... it just feels like Spring to me. I picked through my hoard of Czech glass and crystal... finding lots of beads that worked with the pendant. This is a bold piece that's sure to make a statement! This is a blog hop! I hope you'll check out what everyone else made for this fun challenge! All such pretty pieces Sarajo but I really love those earrings - gorgeous! Per usual, you have not disappointed me! I also love Keri Fund's lampwork beads and your Luna moths necklace is exquisite. I didn't see a picture of your necklace with Andrew Thornton's pendant but I'm sure that it is equally as beautiful! Oh...those earrings are gorgeous! I also love the pendant you received from Erin (I love her stuff) and the piece you created with it. I also love your stash of moth pendants too! Beautiful pieces, all! Love that Erin Prais-Hintz piece in particular..my colours! Oh geez! You have quite the stash! Kerri Fuhr is one of my favorite lampworkers. She is just amazing. I display the beads I have from her in a bead shrine. lol! For what you created this challenge, I adore the first necklace, it is something I would wear in a heartbeat. I also love that it is filled with beads gifted to you, which makes it that much more special. The earrings are so cool! I really love them. You need to make more of those moths! Thanks for participating again this month! It's always fun to see what you'll come up with! You always manage to have such a great collection of pendants for the theme challenges. What an expansive treasure trove you have! My fave are the earrings that you created and the necklace below it with Andrew's pendant! All of these pieces are beautiful! I love the earring charms you and Eric made. Those earrings are fab! And the bold piece with Erin's Simple Truths pendant is wonderful. Wonderful designs and gorgeous components. I'm in love with your lampwork bead. That was definitely a keeper! Stunning pieces! You have a way of showcasing the art beads in the most flattering way! The first and the last necklaces, even though so different, would be my favorite from the batch! From bold to delicate - a diverse array! But... umm. Kerri Fuhr. Swoon. Great jewelry designs showcasing the art beads. Your choices for accent beads were perfect matches for each of the focals. All of your pieces are so beautiful! I love how well the bead colors allude to the moth wings, especially with the ceramic pendant. I love seeing all your options and seeing what you decide to work with! The earrings are adorable!! I'm simply amazed at the amount of moth pieces you had on hand for this challenge. I didn't participate this month for lack of inspiration and materials. Though, I know if I HAD signed up, I would have come up with something. I've already been inspired by many of the reveals I've already seen, yours included. Wonderful job with each and every one of these pieces, though I'm most smitten with the copper earrings with the charms the two of you made. How special! !